Tahiti is a unique paradise with much to see and do. This French Polynesian island is known for scuba diving, sailing, surfing, and even shark viewing for the more adventurous travelers. Though it is the largest island in French Polynesia, it is one of the most secluded. This makes it the perfect destination for a romantic getaway. Read on for more details on this enchanting island! There are many distinct areas of Tahiti. 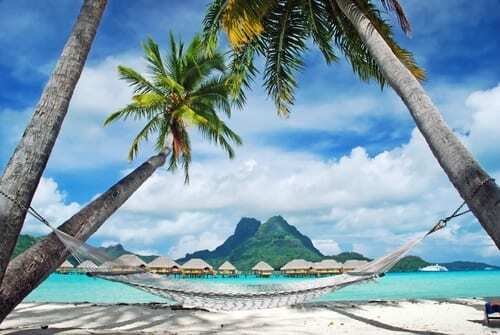 The most commonly visited are Bora Bora, Moorea and Papeete. Find out a little mroe about each of these areas below, plus what to do if you decide to visit. Bora Bora is one of the more popular islands out of the Society Islands of Tahiti. It has near-perfect, postcard-worthy beauty and this is probably the place you most often see when it comes to Tahitian islands. It is located about 140 miles northwest of Tahiti’s capital of Papeete, and is most notable for its overwater bungalows. People visit Bora Bora for luxury, romance and relaxation. It is surrounded by a breathtaking blue lagoon and barrier reef, and is ranked as one of the most gorgeous islands in the South Pacific. In addition, the remains of an extinct volcano rising into 2 peaks at its center adds to the overall beauty of Bora Bora. With crystal clear waters and average temperatures in the high 70’s or low 80’s year-round, Bora Bora is an ideal place for a lot of water activities. Most notably, it is a great destination for snorkeling. We suggest you book a shark and ray tour to swim with black-tipped reef sharks and sting rays. Other water activities like kayaking and paddle boating are popular here. You should also make some time to visit the Turtle Sanctuary at Le Meridien, where you can observe these beautiful animals and swim with them. Moorea is the second most popular region of Tahiti when it comes to vacationers. It is known for lush, majestic landscapes and is much cheaper than Bora Bora. In addition, it has a lot less visitors than Bora Bora resulting in less tourist crowds. In addition to the gorgeous blue-green waters surrounding Moorea, it is also home to rural farming landscapes. Additionally, it is famous for its pineapple plantations. In fact, you can book a day tour of one of these plantations during your visit. Moorea is also a great place for surfers to visit. It is home to Haapiti, one of the most consistent surf breaks in the world. It is also famous for some fantastic dive sites where you can often see dolphins and reef sharks up close and personal. As stated above, you should make some time to visit one of the pineapple plantations if you visit Moorea. In addition, you may want to visit the Moorea Dolphin Center, where you can swim with dolphins that worked for the US government. Cool! You can also get an authentic Polynesian tattoo while you are in Moorea. Papeete is the capital and largest city of French Polynesia. It is a busy harbor town that is frequented by luxury cruise ships and chartered yachts. 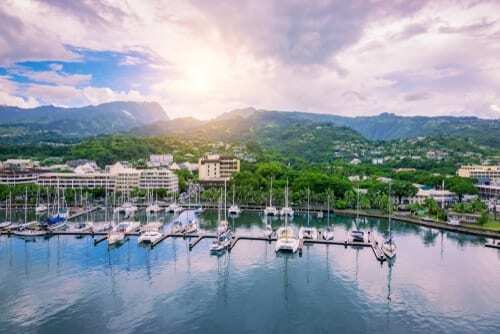 Although it does not have the same allure of tropical paradise as some of the neighboring islands, Papeete still has its own French and Polynesian charm. Papeete is famous for its black pearls, and it is also home to a wide range of handcrafted goods including French fashions. Out of the three islands discussed in this post, this is the French Polynesian island that you want to visit if you are looking for fantastic sidewalk cafes, shopping and a local art scene. Food here can be a bit pricey, but there are also food trucks (known here as “Roulottes”) that offer cheap eats on the go. Perfect for exploring! You can find these along the waterfront park and enjoy a variety of foods and cuisines, both local and otherwise. As mentioned above, Papeete is a great place to shop. For a very unique Tahiti souvenir, head to the Tahiti Pearl Market. Here you can purchase some of their famous black pearls. You can also venture more inland for the Faarumai Waterfalls and the Water Gardens of Vaipahi. Want to book your own tour of Tahiti? Call us today at 402-390-9291 and stay tuned for our upcoming guide on the best places to stay in Bora Bora, Moorea & Papeete.